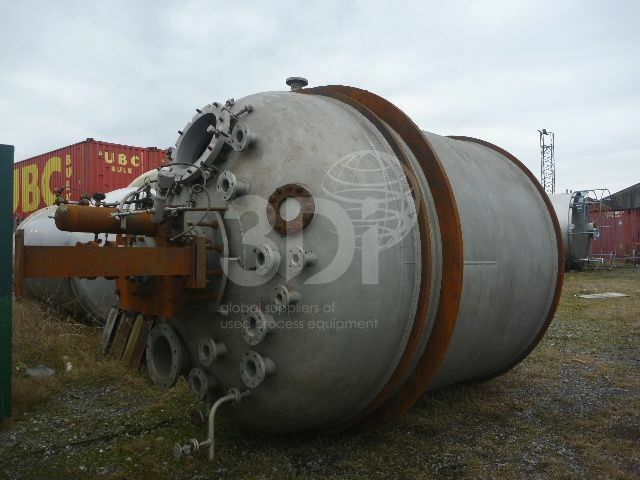 Used 15,000 Litre 304 Stainless Steel Reactor. Orientation: vertical, cylindrical, dished top and bottom. Dimensions: 2650mm diameter, 2500mm on the straight side, 500mm bottom dish, 600mm top dish. Connections: 1 x 200mm, 1 x 100mm, 2 x 80mm bottom connections, top connections 1 x 500mm top man way, 1 x 150mm, 4 x 100mm, 4 x 80mm, 4 x 50mm, 2 x 25mm. Design data: 3bar / FV internal, 6bar internal coil. Vessel thickness 13mm. Reactor is complete with 24 off wraps of 50mm stainless steel internal coil and a twin flighted Lightnin agitator with mechanical seal. Previously used on chemicals.